Growing new bone where none existed before has never been easier. 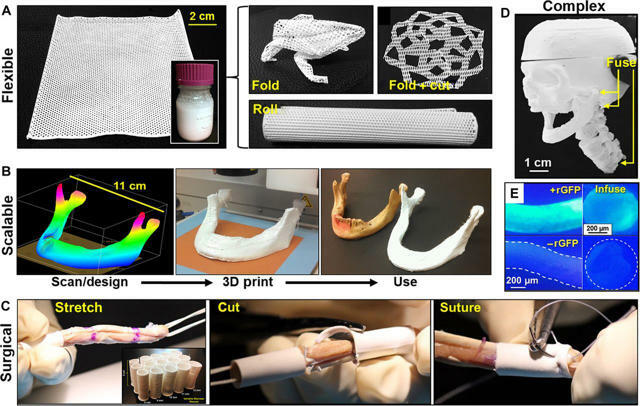 Hyperelastic bone is a new artificial biomaterial that can be 3D-printed and implanted into the body, where it will eventually be replaced by real bone. It’s flexible and has a shelf-life of around a year, but even better it’s dead easy to use and doesn’t typically cause rejection by the host body. HB, as it is known, is made from a mixture of hydroxyapatite—the main component of teeth and bones—and a polymer. The mixture can be 3D-printed into any shape, and comes out flexible, letting surgeons squeeze it into gaps between bones for a perfect fit. The resulting lattice works as a scaffold onto which your own bone will grow, eventually replacing the HB. The biggest advantage of a scaffold is that you can fashion bones where none currently exist, replacing bones where the original has been destroyed beyond repair, for example. The researchers, who detail the new material in a study published in Science Translational Medicine, have had surprise success with the material just by adding human stem cells. The material is porous, which allows blood vessels to grow. The stem cells flourished, filling up the space in the scaffold, and then they started to produce natural bone by themselves. The researchers also conducted in vivo experiments on animals, fusing spinal sections in a rat, and repairing the skull of a rhesus macaque that had been left with weak bone after enduring a series of brain electrode implants. In the case of the macaque, the HB was printed during the surgery itself, after the abnormal bone had been removed and the actual size and shape of the hole was known. This shows another big advantage of being able to 3D-print the bone on demand. There are other bone scaffold methods, but none that offer quite the practical mix of features of HB. It is quick and easy to make, it’s cheap, and it uses “well-established, safe, clinically used medical materials.” What’s more, while it can be printed to order, custom-tailored to the individual (in high-end hospitals, or in cosmetic surgery), it can also be manipulated after use. HB can be cut, rolled, sutured, and folded, say the authors. This, combined with a relatively-long shelf-life, means that it can be used in developing countries. The HB can be manufactured, packed in sterile containers, and stored on a shelf until it’s needed, unlike biomaterials which need refrigerated storage and transport. In short, it seems like a possible breakthrough, equally useful in both modern hospitals and less well-equipped facilities around the world.